See updated information from a June 2012 Sri Lanka Sunday Times article here. Sri Lanka has a long history of tea production—starting with one small plantation 250 years ago in the country then known as Ceylon. 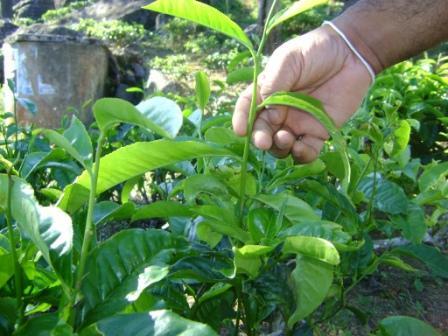 Sri Lanka is now considered a world leader in growing tea. Dilmah Tea incorporated in the 1950s with the intent to move away from larger scale tea processing to focus on tea picked and packed at origin. Even with onsite picking and packaging on smaller scale farms, tea monoculture can leave a large environmental footprint. To offset some of the negative impacts on the land due to tea plantations, Dilmah tea started a side organization called Dilmah Conservation. Dilmah Conservation works with the International Union for Conservation of Nature (IUCN) as its main technical partner. The goal of Dilmah Conservation is “to assist in conserving the environment through interventions that at the same time serve humanitarian needs”. With the deteriorating soil conditions in many Sri Lankan tea plantations due to poor management practices, Dilmah Conservation believes that a Bio Remediation program will be a lifeline for the survival of the industry. This program is introducing techniques for tea plantations to reduce inputs (fertilizer and other chemicals) by at least 50% and increase the land productivity by at least 50%. The project was initiated by the IUCN Sri Lanka in 2008 in partnership with the Tea Research Institute of Sri Lanka (TRI). Subsequently, Dr. J.C. Krishnaratne of Dilmah Conservation has been leading this program to apply biochar at the Palmadulla field at Kahawatte and Nawalapitiya plantations—chosen for their different agronomic and climatic conditions. Dr. Krishnratne’s team produced a wood-chip biochar onsite with an updraft pyrolyzer made from steel drums. The sites selected for field trials had to meet specific parameters: plants must have been pruned 16 – 18 months prior to biochar application and the fields needed to have bush frames strong enough to withstand envelope forking for insertion of biochar. Both trial sites had issues with variations between book records and physical counts and issues with termite and hole borer attacks which made observations on the effect of biochar more difficult. The subterranean termite problem has been an issue for over 25 years in mid-altitude grown (610 m – 1200 m) tea. The test sites found that biochar application caused no additional termite damage nor did it lessen the problem. 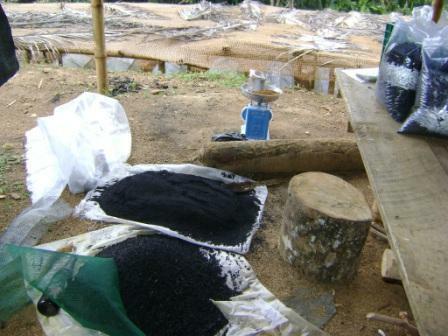 Biochar was applied as a composite of powder, granules (1mm – 3mm) and nuggets (8mm – 11mm) and placed at a 30 cm depth in a vertical line with the leaf canopy. Nine months post biochar application, the team tested the soil at both sites using a non-auger type soil core extractor to pull samples from 15 – 35 cm depths. The team noted some downward migration of the powder-grade biochar, but no displacement of either the granules or the nuggets (however they noted the entry of many root hairs into the larger granules and nuggets). The extracted soil samples were then air dried for four days. During the moisture reduction period, each set of seven individual samples was kept separate. The team found that the biochar-amended soils had higher amounts of organic matter, however the soil pH was lower in the biochar-amended soils. The group is conducting further soil analysis with a laboratory before publishing data on these tests. Additionally, the Coconut Research Institute laboratory performed microbial activity tests with a simple procedure. A calico cloth 20 cm x 20 cm was inserted into the soil at several points in the selected fields and then at other parts on the two estates (used as the control). The results indicated a higher degree of microbial activity in the biochar-amended soils, but these tests will also be repeated to get a larger sample size. The team conducted overall observations at the Palmadulla field test site four days after the last tea pluck and noticed that fresh shoot development had taken place. The color of the new leaf in the biochar treatment was a darker green than that of the control. This suggests higher chlorophyll content—which in tea growth means that the eventual manufactured tea will be a darker representation of black and more valuable. 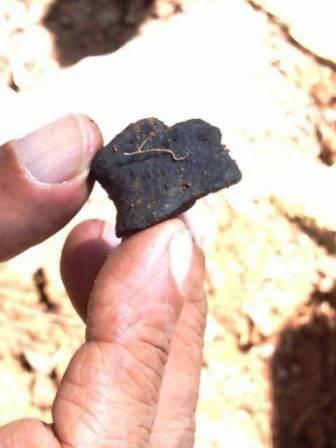 Another observation at Palmadulla was that the biochar-amended crops showed a larger positive response (in terms of new growth) approximately six months after the biochar was forked into the root zone compared to the control. Of special concern to the team is the sensitivity of tea to dry weather. Data recorded over a thirty day period of dry weather showed that the biochar application led to a difference of up to 83.27% crop yield increase against the control. The results visible after the initial trials were positive, but the team is looking to conduct more in-depth trials to establish usage quantities and particle sizes of biochar against soil conditions. The biochar requirements for the in-depth trials showcase the need for an industrial-scale pyrolyzer to make biochar on site. After the first trials, the team decided to relocate the biochar research field trial station to Moratuwa MJF Center premises in order to conduct trials on a range of field crops and orchard crops with the objective to convince government authorities involved in agricultural activities that biochar is a viable option to reduce the dependence on chemical fertilizers. The team is also looking to study the effects of biochar to increase soil carbon sequestration. These trials are currently being set up and the team hopes to record data on them in the next 6 – 12 months. 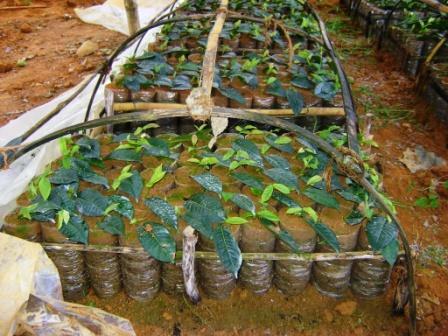 If biochar can be shown to have a consistent beneficial effect on soil microbial populations, increased plant growth, and the ability of the soil to withstand drought, the tea industry in Sri Lanka can benefit greatly; not only with larger production but also in decreased chemical fertilizer use and improved soil health. For more information on this work, please contact Asanka Abayakoon. Manufacturing biochar; all photos courtesy of Dilmah Tea. 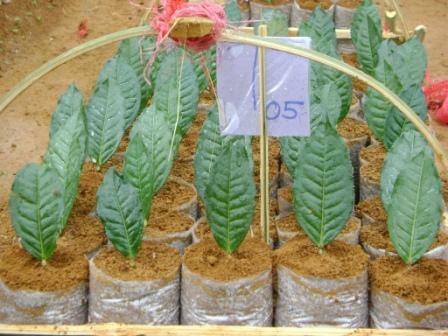 Biochar applied to soils at the plant nursery. Trials 3 months after biochar application. Biochar applied directly to the field. Growth of new shoots after biochar application. 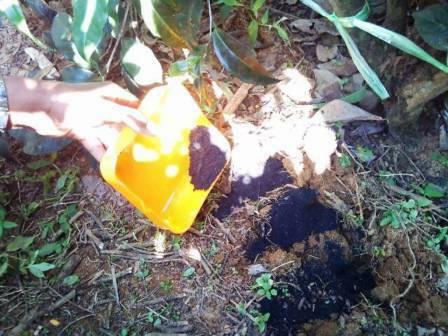 Biochar taken from the soil 3 months after application shows root growth through the material.